In January I spent a week in India in part to wrap my head around C.K Prahalad's "Bottom of the Pyramid" theory, which in many ways resembles the Long Tail. Are they in fact the same? Is the bottom of the pyramid the Long Tail? The similarities are notable. Both theories are based on the notion that if you break the economic and physical bottlenecks of distribution you can reach a huge, previously neglected market. They both recognize that millions of small sales can, in aggregate, add up to big profits. And they're both focused on ways to lower the cost of providing goods and services so that you can offer them at lower price point while still maintaining margins. But despite the fact that it took me a trip to India to clear my head on this, I think there is a key difference between them that makes them fundamentally incompatible. The Bottom of the Pyramid (BOP) argument is essentially based on commodification. Take existing goods and services and make them an order of magnitude or two cheaper, either to buy or to make but ideally both. Typically, this means reducing goods to their bare essentials and delivering them on a massive scale. This requires: 1) low price points; 2) minimal marginal costs (reduce consumables and packaging to the bare minimum); 3) "de-skilling" services so non-experts can deliver them; 4) the use of local entrepreneurs. I visited a hospital that was offering advanced health care to the poor by increasing the utilization rates of its expensive CAT scan and X-ray machines by a factor of 100 by running them 24/7 and using digital imaging rather than expensive film. They also brought top-quality consultation to remote villages by having low-skill technicians place sensors on a patient's body while a high-skill doctor evaluates the results in real time via a communications link from a hospital in the city. In all these cases, the BOP model is focused on taking a single product or service and finding ways to make it cheap enough to offer to a larger, poorer, market. This is why I think it's essentially about commodification. The Long Tail, on the other hand, is about nicheification. Rather than finding ways to create an even lower lowest common denominator, the Long Tail is about finding economically efficient ways to capitalize on the infinite diversity of taste and demand that has heretofore been overshadowed by mass markets. The millions who find themselves in the tail in some aspect of their life (and that includes all of us) are no poorer than those in the head. Indeed, they are often drawn down the tail by their refined taste, in pursuit of qualities that are not afforded by one-size-fits-all. And they are often willing to pay a premium for those goods and services that suit them better. The Long Tail is, indeed, the very opposite of commodification. So the Long Tail is made up of millions of niches. The Bottom of the Pyramid is made up of mass markets made even more mass. Both lower costs to reach more people, but they do so in different ways for different reasons. They're complimentary forces, but fundamentally different in their approach and aims. The Mystery of the Apparently Similar Theories: Solved. Or they are both about taking a market and finding the core value proposition that you can factor out that allows the creation of a business that has both sufficient scale to survive and can reach a very very very large population. In one case a population that population is niches of taste in the well to do and in the other the population is long tail of the income distribution. The business puzzle is the same though; finding the key elements that you keep in the business. In this sense the franchising is a long tail business model; the franchise chain aggregates a long tail of outlets. The variation in the outlets is local, or situated, while the core is the bits that achieve scale. The long tail generally refers to a Y axis of popularity (perhaps measured by units sold * revenue per unit) and an x axis ranking items from greatest popularity to lowest popularity. The area under the curve represents total dollar value. So it points out that many businesses for which stocking items carries costs are unable to address much of the total demand, whereas businesses that can have lower costs for stocking an item (because its not stored on retail shelving, or is not editorially looked at as in the case of search keyword advertising) the addressable market can become quite big. 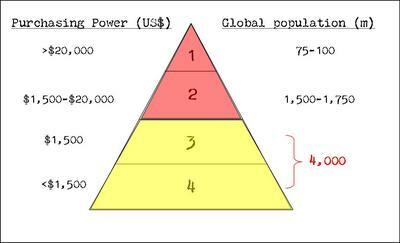 The bottom of the pyramid refers to a Y axis of wealth level, and an X axis that depicts the wealth level * the number of people at that wealth level. The area inside the pyramid indicates total dollar value. So it points out that by dropping the price point or changing the value proposition to better fit the needs of those of lower wealth levels one might actually be addressing a larger potential market, particularly since if you hit the bottom of the pyramid you might also be satisfying the top of the pyramid. So both ideas are about expanding the addressable market. It's just that they represent different but complementary approaches. Put another way, create a cost structure that permits a wider selection, and a lower price, and you benefit from both the long tail and the bottom of the pyramid. Of course, following this approach does not immunize you from your competitor copying the same business model. By that reckoning, it sounds like micro-lending would still share some Long Tail attributes. Micro-loans are typically quite customized and not something the short part of the tail is equipped to provide. I think your argument on the difference is wrong, even if your conclusion may be right: As far as I know, successful marketing to the very poor is NOT about economies of scale as you suggest, but always involves taking the scale OUT of the market, just like the long tail does. In general succesful products for the poor are made locally, and while a given success story, like micro loans or high quality low tech water pumps, may be replicated in many places, none of the local successes are dependent on the others. Scale does not matter. The difference to the long tail is another one than you suggest, namely that the cost of aggregating this wealth within a single company is high, because organization is expensive and ad hoc among the poor in contrast to the cheap standard organization supplied by the internet. So we won't see an Amazon for the poor, because there is no advantage in scale. I would like to address something Claus brings up - decentralization - appears vital in thinking about addressing the horizontal long tail or the lower layers of the pyramid. How an MNC would want to agglomerate profits is a different matter than some double-bottom-line company trying to spread wealth creation opportunities. Centralization of profits feels like exploitation; decentralization of profit opportunities feels like development. they interact. Can the development of long-tail markets create new incentives, opportunities, risk-management strategies, etc. which enable businesses to invest in bottom of the pyramid markets? The "bottom of the pyramid" model is a creation by c.k.prahlad based on the "yoga" economic model. "You sow an action and reap a habit. You sow a habit and reap a character. You sow your culture and reap your Destiny. Hence, Destiny is your own making. And how you make it. The "yoga" economic model has "
i.e. consumption is the bedrock of an economy which depends on the "UPABHOKTA"
WHAT IS PRODUCED IS BASED ON WHAT IS TO BE CONSUMED. HERE THE LINKING OF "UPAYOGA" AND "UDYOGA" COMES INTO PLACE "THE WORD YOGA ORIGINATES FROM THE SANSKRIT WORD "YUJ", TO UNITE - TO INTEGRATE - TO COORDINATE. From the Study of the origin of action, it appears as though one is left with no choice but is destined to act as per one’s own tendencies. This is not true in the case of human beings. Karma is a Sanskrit term that signifies action or deed. Any physical or mental action is Karma. Thinking is mental Karma. Karma is the sum total of our acts. Karma means not only action, but also the result of an action. The consequence of an action is really not a separate thing. It is part of the action and cannot be divided from it. The Law of Karma means the Law of Causation. Wherever there is a cause, there an effect must be produced. For example, a seed is the cause for a tree, which is the effect. The tree produces seeds and becomes the cause for the seeds. The cause is found in the effect and the effect is found in the cause. The effect is similar to the cause. Therefore, the cause is concurrent and inherent in the effect. This is the universal chain of cause and effect. No link in the chain is unnecessary. This world runs on this fundamental, vital law. This law is inexorable and immutable. This grand law operates everywhere in the physical and mental planes. No phenomenon can escape from the operation of this mighty law. All other laws of nature are subordinate to this fundamental law. No event can occur without having a positive, definite cause at the back of it. The breaking of a war, the rise of a comet, the occurrence of an earthquake or volcanic eruption, the breaking of an epidemic, thunder, lightening, fire, floods, diseases in the body, fortune, misfortune, etc., all have got definite causes behind them. The grand law of causation includes the law of action and reaction, the law of compensation, and the law of retribution. All these laws come under one general all embracing heading namely the DOCTRINE OF KARMA. The "EFFECTS" of the past certainly have a pull upon us who are striving in the present (CAUSE). That is precisely because the present is the product (EFFECT) of the entire past. All financial wizards are interested in interest because the interest is calculated on the basis of products, which again is nothing but the number of days of the past multiplied by the loan amount outstanding. Advance or loan (loanable funds) is the cause interest income is the effect. (B) The "EFFECT" is none other than the "CAUSE" itself in another form. profits; profits are a part of the owned funds, which again form part of the loanable funds viz. The "cause". (C) When the "CAUSE" is removed from the "EFFECT" nothing of the EFFECT can remain. (D) Therefore, the cause is concurrent and inherent in the effect. (Interest income is the effect; if interest earnings are more, profits are more; if profits are more, owned funds will be more; if owned funds are more, one will be able to borrow more borrowed funds and increase the loanable funds (viz. Cause).  Out of these three causes, the "Efficient Cause" alone is the determinant of the effect. This is explained by the following example in the making of a mud pot. In the making of the mud pot, the entire management philosophy has been abundantly made crystal clear by the Rishis of Yore. How true it is being constantly repeated by the management institutions all over the world will be clear by making an introspective study of this example. In the making of mud pot, there are the following five elements (THE PANCHA BHOOTAS OF MANAGEMENT) akin to what the modern Management Gurus proclaim as the five "M’s". 5. The Money (fixed and working capital spent on buying the clay other chemicals water, purchase of potter’s wheel, the Yagnashala (i.e. the potter’s factory), The cost of potter’s own labour (imputed cost) investment in the construction of the Kiln, the cost of fuel for baking the pot, etc.
" GUNITA SAMUCHHAYAHA SAMUCHHAYA GUNITAHA"
"The product of the sum of the coefficients in the factors is equal to the sum of the coefficients in the product". The Law of Causation works in all planes of activities, through the process of integration (YOGA), similar to the "ENTERPRISE RESOURCE PLANNING". KASYA AHAM KA CHA ME SHAKTIHI ITI CHINTYAM MUHUR MUHUHU"
What is the place? What is the income? What is the expenditure and what is the profit? Where do I stand? What are my strengths? Brooding over these again and again, one should undertake a venture. This is the most important out of all the three causes. This is the potter himself. Men alone are responsible for all the achievements (both positive and negative) OF THE WORLD. The potter’s technical knowledge, the way he shapes and gives form to the pot, the technical know-how and expertise in selecting and using the proper clay, colour and chemicals, the baking the pot in the kiln at the required temperature, these alone determine the quality of the output viz. The mud pot in our above example. In all the above operations the "efficient" cause works in and through the potter. He may have a lot of clay and other materials with him. He may have a number of potter’s wheels and kilns with him. It is for him to use these to the maximum extent and derive the maximum benefit. That is why he is called the ‘KUMBHAR’, the "VISHWAKARMA", the "PRAJAPATI", ETC. The Rishis of Yore finally came to realise that the play of the "cause" and "effect" takes place only in the medium of ‘’Time Concept". THE "CAUSE" IS ANTERIOR IN TIME. THE "EFFECT" IS POSTERIOR IN TIME. IN SHORT, THE "PAST" IS THE CAUSE AND THE "PRESENT" IS THE EFFECT AND THE PRESENT ITSELF BECOMES THE "CAUSE" WITH REFERENCE TO THE "FUTURE". Interest, exchange, commission, brokerage, rent, rates, taxes, duties, levies, sales, purchases, profits (losses too), - in short the completion and commissioning of a project – all have the TIME concept for its accrual, for its measurement. Since, we exist in the present, we are not only the "EFFECT’ of the "PAST" but we are also the "CAUSE" for the "FUTURE". Thus, we can, if we intelligently live in scientific self-discipline, become the "CHARTERED ARCHITECTS" of our own FUTURE! Consider a log of wood floating down on a river, which is flowing at a speed of say, two miles an hour. The speed of the log of wood should then be the same as speed of the river (two miles an hour). Now, suppose, we fix a diesel engine on the log, and start the motor to run at 10 miles an hour, then the log of wood will float at 12 miles an hour down the river or 8 miles up the river. The log of wood with motor under its CAPTAIN is "free" to move down the river or up the river, among the right or left bank of the river and the alert CAPTAIN can safely negotiate it by the right or left of the obstacle en route. Yet it cannot "ESCAPE" the rate of flow of the river. THINK, COGITATE, AND REFLECT ON IT PLEASE. FROM THE WOMB TO THE TOMB"
In short, according to the Upanishads, wherein we have the entire science of the self, the Rishis of Yore concluded their intelligent investigations and declared a soul satisfying philosophy of life. THEY CONFIRMED AND DECLARED "WHAT YOU MEET IN LIFE IS "DESTINY"; and "how you meet them" is "FREE WILL". Pause and think please. THUS, LOOKING AGAINST OUR PAST, WE ARE NOW HELPLESS VICTIMS OF OUR PAST ACTIONS, BUT LOOKING AHEAD OF US, WE BECOME THE CHARTERED ARCHITECTS OF OUR OWN FUTURE BUILDING. Human as we are, let us never look back for a moment but dynamically march forward creating a glorious future of magnificent achievements by rightly exercising the independent self-effort, which is man’s prerogative. you wrote "I visited a hospital that was offering advanced health care to the poor by increasing the utilization rates of its expensive CAT scan and X-ray machines by a factor of 100 by running them 24/7 and using digital imaging rather than expensive film. They also brought top-quality consultation to remote villages by having low-skill technicians place sensors on a patient's body while a high-skill doctor evaluates the results in real time via a communications link from a hospital in the city"
this is only oneside of the coin. the otherside is ghastly henious. you will be appaled to the fact that the hospital staff force the doctors to recommend CTSCAN to each and every patient even if it is not required because they(hospital staff) need to make money out of this expensive equipment. and the impact is that the poor who struggle to get atleast one sqaure meal a day are made to cough up 1200 to 2000 rupees to get the scan done.....which is cruel and criminal...........isnt this an absolute failure of comoditization? Umesh comments that forcing the poor to pay for scans demonstrates the failure of the principle. Surely, what that demonstrates is the failure of human ethics to control the process. There is also an assumption that they must have all the patients taking the scans as though there is some shortage of patients and they must use all of them. Whereas the reality is more likely that if they were more selective then they could carry out more scans of additional patients. Again, a failure of the human management process rather than of the priniciple itself.